Small, fast, light and easy to customize - we’ve heard it all before - but I’d say that Bodhi Linux has enough individual character to warrant consideration. Under the hood, Bodhi is based on Ubuntu 10.04 LTS. I consider this to be a point in its favor as I am wary of smaller distros that are not connected to a bigger, well supported distro. Bodhi comes with only a few applications, and personally, I like this way of doing things. Give me a web browser, a package manager and a few of the other basic tools and I’ll add things as I need them. Bodhi uses the Enlightenment window manager. When you log in from live media you are presented with a menu that allows you to choose between a composited or software rendered desktop and a few different themes and layouts. Having carried out a hard disk installation, the first log in repeats the procedure, along with a few other last minute, mostly cosmetic options. As an aside, does anyone else find it ironic that Enlightenment has transformed from the standard bearer for Linux-powered eye-candy to a window manager favored by those who demand responsiveness and minimalism? I have to confess that it had been a long time since I last had a play with Enlightenment, and I liked what I saw. Now I’m going to get all subjective, but it offers really great “feel” in terms of responsiveness while looking great and a just a little bit flashy. If I say that I haven’t written a great deal about Bodhi because there isn’t a huge amount to say, don’t take it the wrong way. It doesn’t offer a revolutionary new take on how a Linux distro should work, and it doesn’t try to. 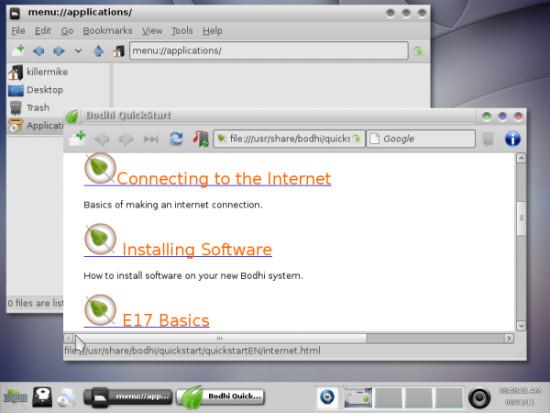 Instead, it offers an Enightenment desktop upon a basic Ubuntu base along with a few basic tools to get started. One misgiving I have about the setup is that it’s based on the (still maintained and patched) Ubuntu 10.04 LTS release. On the plus side, a long term support release means that full system upgrades have to be carried out less often and it should constitute a rock solid base by now. However, it also means that you are limited, in terms of additional software, to whatever would work on an Ubuntu 10.04 setup. [Update/correction: Looks like I made an oversight here. It seems that Bodhi has its own repositories and does some serious backporting. Note that this won't give you access to all of the up to date software that a more modern base would. As we discussed recently, there is a growing demand for Linux desktops that are up to date but that look and work along the same lines as a Gnome 2/KDE 3/Windows XP setup. It’s also worth noting that Bodhi is designed to run well on older, resource constrained systems. According to the website, Bodhi can run on a 300MHz PC with as little as 128megs of RAM and 1.5GB HD, and I can believe it.